Morel mushrooms are about to arrive. Shiitake Mama reveals why they grow in spring and why they're hard to find. Morel mushrooms are about to arrive, according to Shiitake Mama of Lost Creek Mushroom Farm. Delicious and mysterious, hard to resist and hard to find, Shiitake Mama reveals why, and how to know when they will appear. “The first big rain after the redbuds or the dogwoods bloom starts the 'fruiting,' Expect the first morels within a week after that big rain. The season goes for 4-6 weeks, depending on where you are and rainfall.” In lower elevations and mid-continent, morels are up from mid-March to mid- or late April. In higher elevations and farther north, the season can run from April into June and later. Available for only a short time, morels are considered by many to be the most desirable wild mushrooms; valuable because they’re hard to find, and mysterious because they may disappear from year to year. As with many mushrooms, the real “body” of the morel is underground, in a wide-spread, interconnected fabric of thin white threads, called mycelia. Ideal air temperatures, soil temperature, and soil moisture signal the mycelia to form their fruiting bodies, morel mushrooms. These conditions occur only in the spring. The scientific name is Morchella esculenta. Morels are cone-shaped, like Christmas trees and are honeycombed or pitted (some people say they look like brains), with white stems. They are completely hollow – an important characteristic for telling morels from look-alike mushrooms. Edible morels can be yellow, tan, gray, black, or white. Shiitake Mama says, “Do your research before you hunt. There are similar mushrooms that can make you uncomfortable. 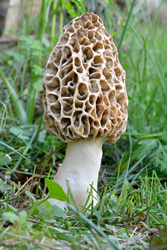 For more information on identifying morels, I recommend mushroom expert and author David Fischer’s Americanmushrooms.com." Why are morels so hard to find? Shiitake Mama says: “First, they have an intimate and exclusive relationship with their specific environments. Morels that grow on one side of your yard may not grow on the other side. They’re extremely sensitive to the soil’s chemical and probably to its vibrational or energetic makeup. We just don’t know, though a great deal of research has investigated morels in hopes of cultivating them. “Second, they may not come up in the same place again. They have an 11-year life cycle. Mushroom hunters fiercely protect their morel patches and don’t tell. Shiitake Mama says: “No real rule. I read that they won’t grow under junipers (cedars) and found two clusters under one tree. In leaf litter and in grass and open fields. On creek banks – that’s been good in some years. On our farm in Oklahoma we find them under oaks, elms and persimmon trees." How to cook morels: Soak them in salt water to remove insects. Let them dry thoroughly. Fry them dredged in seasoned flour or cornmeal, with or without egg. Sauté them in butter with salt and pepper. Stuff them with jalapenos and cheese and bake or fry them. Shiitake Mama’s favorite: Butterscotch Morels – Sauté them in butter with brown sugar, salt, pepper, and garlic powder. She cautions, "do not eat raw morels. Some people have a serious allergic reaction when consuming morels and alcohol together. When you pick them, leave some in each area to keep the patch growing." Shiitake Mama says, “If you have an abundance of morels, have a morel party. A wonderful bonding happens when people eat morels together. You can dry them or fresh-freeze them on a cookie sheet and follow Fischer’s advice on cooking frozen mushrooms. Lost Creek Mushroom Farm Shiitake Mama 10" Log Kit, $33 including shipping. Kits from $20-$90.